The Family Zone is a space where kids of all ages can play and engage with hands-on activities. Take the Road Trip Challenge: The Road Trip Challenge kiosk was created by students from Renton Technical College. 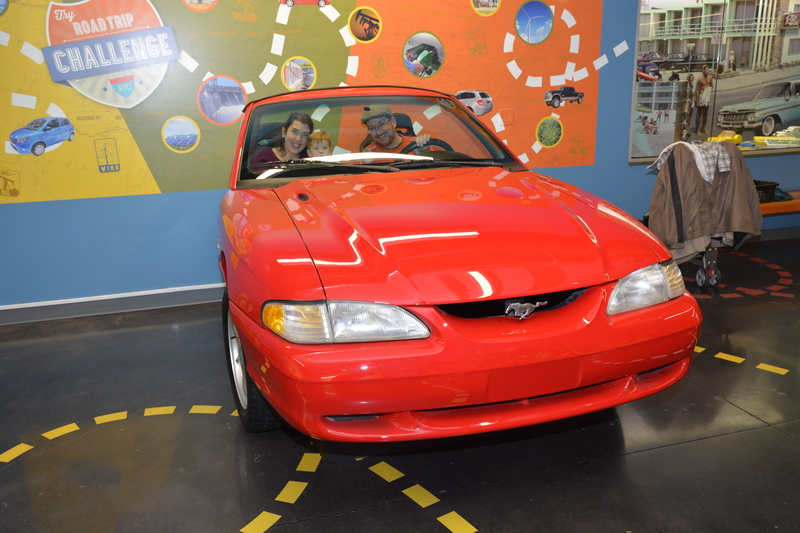 A 1998 Ford Mustang was converted to serve as a vehicle for the Road Trip Challenge to teach strategies for wise energy use. On a touchscreen visitors may choose and customize a vehicle, then select fuel to travel to familiar destinations across the country. Learn How Cars Work: A chassis with exposed parts is the perfect opportunity to explore the basic systems of how cars work. Take the Wheel: Visitors of all ages are eager to climb into the cars at ACM; now you can see what it feels like to “drive” one. Built for Speed: Race pinewood cars down a track and experiment with the science of speed. Go for a Road Trip: Share road trip stories across generations. Prepare for new memories as your little ones drive from sea to shining sea across our oversized map of the United States. Share Car Stories: What moves you? Art Station: Design a car for the future and share your experience at the Museum by decorating your own postcard. Take the Road Trip Challenge in this 1998 Ford Mustang.